We’ve all dreamed of becoming something big, dreamed of being remembered by everyone. Starting at rock bottom clueless, carving our own path towards a dream. It was all we had to hope on, our hands to work with and our dreams in mind. Despite what everyone is saying, here you are — you have your own company and now stand among your loyal companions. But the thought had struck you that there is so much more than what you expected. You may be standing proud of what you were able to build, but now there lies competition. And they don’t come in tens or hundreds; they come in the millions. Each and every one of them holds a story similar to yours. All bear the same dream of reaching the top. How does one rise up above others and gain a lead? What’s the secret technique to achieve such success? Look no further, for you will now learn why you need outsourcing for your business. Enough deep tone and reflection; we’re not here to give you a good values education class! Before you embrace the thought of global outsourcing and why you need outsourcing, let us first define what it means. Business process outsourcing, to cut it short, is reaching out to different people outside contracting non-core activities. Imagine if your business struggles with and has trouble managing its workload. You can’t afford more and your resources are limited. With everything piling up and stress starting to get to you, what should you do? This is where the advantages of outsourcing shine the most. With the countless capabilities and flexibility that outsourcing offers, there is little question why you need outsourcing. But what are these benefits that we speak of? This one is quite a no-brainer! With jobs like data entry and call center support placed in the hands of world-class workers from around the globe, there is little you have to worry about. Because of the time you just bought yourself, your company can now focus on the core functions of your business. Truly this benefit alone could stand as a testimony of the significance of outsourcing. A company that can focus on its core business leads to an overall increase in its effectiveness and efficiency. If you find your company suddenly losing its focus and having to micro-manage left and right, then perhaps you need outsourcing. People around the world hold their own uniqueness and awesomeness. Wherever the road may lead, no matter how far the sea stretches, there are bright-minded people throughout the world. And how do these aspiring individuals reach your company? It is through the use of outsourcing. Lose Less and Start Gaining More! If there is one benefit of outsourcing that should attract you, it is the cost efficiency. When we mentioned you’d be able to save resources, we really meant save – which may mean rescuing your whole financial situation! Many globally-competitive individuals mentioned above are more than willing to work at a competitive price to meet your budget. They also offer comparable quality that you’d expect from a full-time worker. Heck, we could go as far as say they’re even better. With the amount of money and resources that would have gone to training new employees and equipping them, you’d be able to save and allocate it to functions that need it more. Needless to say, this is one of the pros of outsourcing. If the words “need outsourcing” aren’t filling up your head, then you’re not getting the whole picture! When we say open, this encompasses a whole ton of meaning. Not only will you start getting world-class capabilities from around the world, it will also open a lot of opportunities. With the idea that you’ve just partnered with an offshore company, you are able to extend your services 24/7. Not only that, but this 24/7 starts to become available worldwide! Merely thinking of the possibilities is astounding. By the time your competitors find that they need outsourcing, you will be light years ahead in the game, making a name for yourself everywhere around the world! You’ll be glad that you looked up “need outsourcing.” Divide and conquer the entire business playing field just by outsourcing. Now you’re probably hyped about all the advantages of outsourcing. If there is anything companies should be saying more, it’s “we need outsourcing”. But where does one look for outsourcing? Global outsourcing sounds really tedious at first glance but knowing where to look for it is a huge step. There are countless other countries out there that you may outsource from, ranging from China to India to the Czech Republic. But the one that shines the most is the Philippines. Outsourcing to the Philippines has proven to be most successful for most businesses, especially from the West. 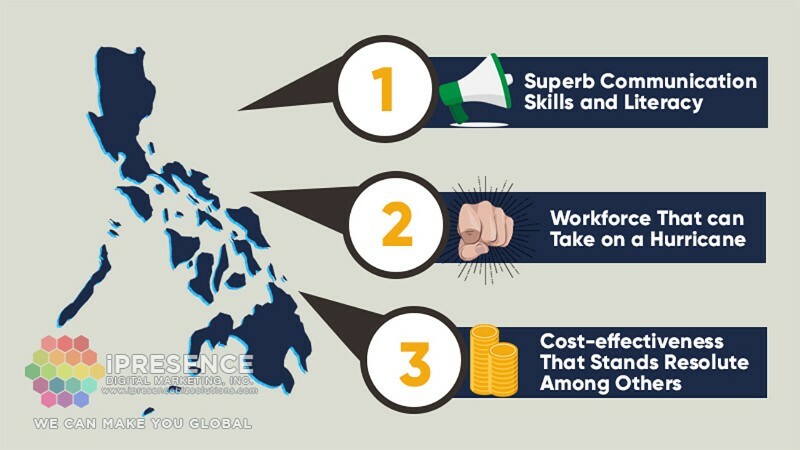 Why Should You Outsource to the Philippines? The Philippines has grabbed the world’s attention, and for good reason. The country has grabbed it with a workforce that meets global standards. The cost also rivals the effectiveness of other countries worldwide. Philippine workers’ literacy and communication skills stand out among the crowd. It is understandable that these Filipinos mean business. Now let’s get into detail. One great problem that businesses face when outsourcing is the language barrier. Ask anyone who’s tried it; they’ll take our word for it. You just can’t expect everyone to be as fluent and good in English as you would want them to be. This is where the Filipinos shine. English is a language that many of them practice in their day to day life. It is met with high regard in their education system as well as a means of global opportunity for their people. The lack of language barrier will make communicating a hundred times easier for everyone. Communication skills that rival even first world countries will leave you speechless, allowing them to take up anything related to this. Can you see the light starting to shine on why you need outsourcing? If you’re not already sold on the strength of communication, then work ethics will have you blown away. Filipino workers are known to be one of the most hard-working people in the world. They are both loyal and honest – staying true and fulfilling the duties they were assigned. They go out of their way and do things without you even mentioning it! Talk about next level partnership – all you have to do is hire them. This stems from their need to do a job, pushing them to do whatever it takes to keep the blessing you’ve given them. Your need for outsourcing is their answered living. Compared to several other countries worldwide, the Philippines shines with regard to cost-effectiveness. When outsourcing, one of the main goals is to cut down on expenses and save money. Working with Philippine workers and outsourcing business is a great and accessible way of doing this. This stems from the need for work and the government’s support towards job generation. Outsourcing to the Philippines is not only a benefit for one side but for both parties. You are able to manage your financial situation and you’ve just granted someone else’s dream. This is a beauty that you fulfill when you answer your need for outsourcing. If none of these have taken your interest yet, there are several sites that back this up. There’s the Outsource Accelerator that is ready to provide you with a start on everything you need to know on why you need outsourcing. One great practice of theirs is The Source which aims to generate attention on the internet, giving information about business process outsourcing. But What Should I be Asking for When I Need Outsourcing? What better way to do this than to look at a partner company itself. One example is iPresence Digital Marketing Inc. They aim to provide their clients the solution to all their problems and make them more global! They have hundreds of 5-star customer reviews. This company has been providing digital marketing solutions since 2001. They offer content writing, explainer videos, voice over, graphic design, website design, virtual assistance, transcription, forum marketing, and keyword research services. You will find them on Facebook, Twitter, Instagram, and LinkedIn. With the number of services offered, that just means more for companies to look for! They even have videos explaining each service for any possible client’s consumption – top reasons for being a top of mind digital provider and how they can make your business global. This is just the tip of the iceberg and it already offers so much. It can’t be denied now how effective outsourcing can be. With the number of benefits and advantages it brings, what are you waiting for? With all this and more to outsourcing, we can come to the agreement that you need outsourcing! Not only will the journey be beneficial and help your business grow, this will also help you grow as a whole and with more people. So, take the first step now and don’t even think of standing still!